Calvin Fisher gets behind the wheel of the mighty Porsche 911 GT3 RS. Here's what he had to say about the 383kW monstrous super car in Cape Town. Two simple letters - RS. You'll find them on everything from a very quick Audi to a Ford Focus, also several Renault's and Chevrolet's and at one point the badge had clearly taken a wrong turn and found itself on the arse of a 2005 Kia Rio - but the less said about that one, the better. Instead, let's appreciate it for where it truly belongs, on the mightiest rear end to ever have the honour. 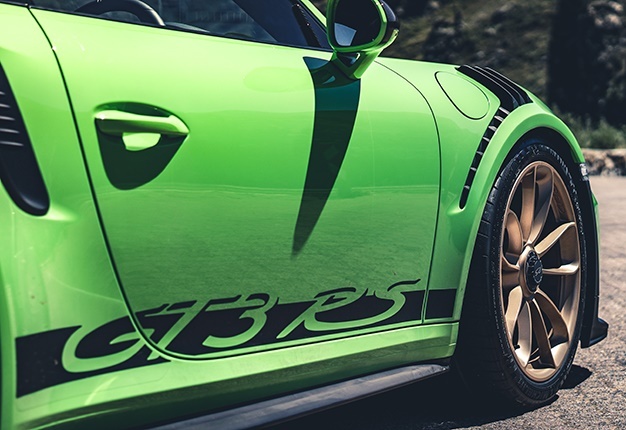 Meet the Porsche 911 GT3 RS. Now, look at it. Just look at this beautiful green beast - and disregard for a moment the fact that it has a R5-million price tag. For your money, you get an obscene rear wing, massive air intakes and wheels so big they look like they're trying to escape the arches - a package further enhanced thanks to the Weissach upgrade package. The seats are buckets of the finest calibre just calling me, goading me to climb inside. The message is clear. "Take me to the nearest race track at once, so I may feed." And feed it will because those black GT3 logos actually mean something. In this case 383kW and 470Nm from a flat six 4 litre engine that revs all the way to 9 000 rpm. Turbochargers? Not on your life - this is all motor, and still it will punch the horizon to the maximum tune of 312km/h. It will leap from standstill to 100km/h in just 3.2 seconds and yes, it is my plaything for the rest of the afternoon. Sure it's naturally aspirated, but it's hardly what you'd call analogue. There's definitely the sense of a ghost in this shell, many clever systems helping you go quickly and with no great drama. There's even rear wheel steer here to help you point it along the black stuff instead of, well, those bushes. At 1430kg it is lightweight, whilst that familiar teardrop 911 profile means its inherently slippery through the air - so downforce needed to be added, and was. That's the wings and aero bits I mentioned earlier. Drop your bum into the precious driver's pew and you'll notice immediately that despite being an RS model, it's not exactly a stripped out racer. The door handles are green fabric strips to match the green seat belts and I'd wager they're for the ambience more than necessity. What is arguably necessary is the additional four-point harness should the belts not suffice. Necessary because fast. Because very very fast. but also verily a luxury vehicle. One that devours other luxury vehicles. I strap in and embrace a purposeful helm devoid of tack and multimedia controls - this is the business end. There are no mode buttons here either, the GT3 RS is all about that one fierce setting. All that is switchable via the centre console is a loudness setting on the exhaust; VERY or ALERT THE POLICE. The other variable is on the PDK auto, normal or sport. You'll find them both lightning fast with the latter happy to hang onto a gear longer. That's the one I select and you'd be right to assume I've opted for maximum noise as my soundtrack. The next part is a beautiful green blur in my memory, of carving up Franschhoek Pass in one direction and the immaculate tarmac of Rooi Els upon my return, but I can remember the finer points. Telepathic steering and acceleration. One; see a gap, take the gap, that 470Nm of torque feels like a million thanks to a rapidly revving motor. Two; think about an exact pebble of asphalt at the apex and you'll simply be there. Repeat often. Smile constantly. This is instant gratification like you've only ever dreamed. Believe me, I've dreamed of it since. The 911 GT3 RS then is no cheap thrill. And why should it be? This is no longer a sports car, this is an all-out supercar. One meant explicitly for the racetrack but, and we're very grateful for this, that lives to terrify lesser traffic on the public roads too. Long may it do so. Subaru's BRZ 2.0i Sport+ is an athletic ride with 6-speed manual transmissions. It's designed to be a modern and above all affordable sports car. We put it through its paces. The all-electric Jaguar I-Pace has completed an historic treble at the 2019 World Car Awards, while Nissan unleashes another special edition of its 370Z roadster.